S awflies are non-stinging wasps that have their ovipositor serrated like a saw. The “saw” is used in making slits in the plant. Eggs are then deposited in the slit. The redheaded pine sawfly (Neodiprion lecontei) over-winters in a prepupal stage in the litter under the tree. In the spring after completing pupation, the adults emerge. Eggs are laid in slits in the edge of needles. The larvae feed on the foliage. At first the small larvae eat only the outer layer of the needles. The white pine sawfly also feeds in the spring. It primarily attacks Eastern white pine, but will also attack other pines. Its life cycle is similar to the redheaded pine sawfly except that there is no second generation later in the growing season. As they grow larger, the entire needle is eaten. After four weeks the sawflies fall to the ground to spin a cocoon. There is usually a second generation later in the growing season. 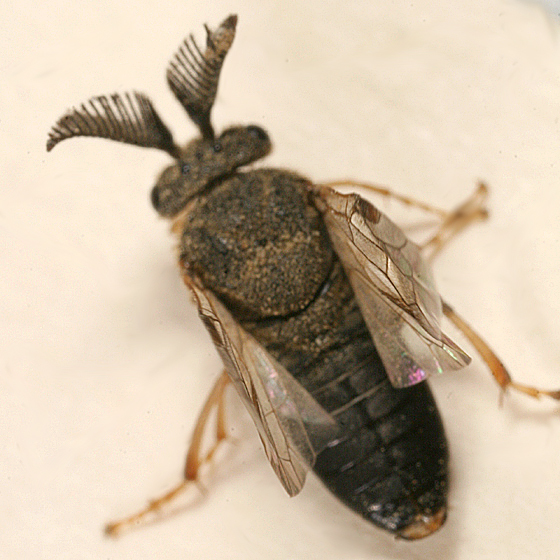 Mice (eat the pupae) and diseases often cause the populations of this sawfly to crash. The European pine sawfly (Neodiprion sertifer) is found in large numbers and “waves” in mass as a means of scaring off predators. It feeds on mugo pines as well as many other pines. This sawfly larva feeds for about six weeks. They feed on older mature leaves, leaving the emerging needle alone. 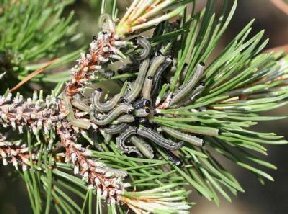 Failure to control the European Pine Sawfly insect is not usually fatal to the plant. However, a more sparse plant will be the result. However, redheaded and white pine sawflies can kill branches or the entire tree if numerous. If an insecticide is applied, it is best done when larvae are hatching or very small to minimize damage. Time to treat often corresponds to saucer magnolia petal drop. Control as soon after egg hatch as possible. Contact our specialists at Hillermann Nursery & Florist for remedies to use.